Yes, being a parent is the most rewarding, joy-filled, eye-opening experience you’ll ever have. But also: It’s insane. If you’ve got little ones at home, then surely you can use a laugh. (We gotcha.) 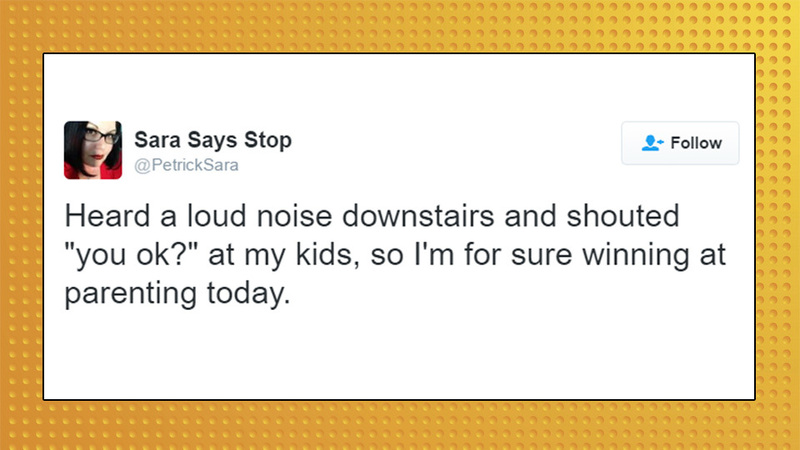 Here are 10 hilarious tweets from parents this week. From super-obnoxious toddler toys to never-ending mealtime battles, these tweets are bound to make you LOL. There's nothing I've learned from being a father that I couldn't just as easily have figured out from setting all my money on fire. Heard a loud noise downstairs and shouted "you ok?" at my kids, so I'm for sure winning at parenting today. I can never take a picture in my house without first having to move a laundry basket. My parenting book that I'll never write is now called "Whatever Works (We are all winging it anyway)". Rainy days used to be a great excuse to veg out. Then I had kids. If I don't find them something to do ASAP, they'll burn the house down. "I'm starving. But not eat fruits, vegetables, or anything you made for dinner starving. Husband: "How do the kids keep getting sick?" Me: [picturing all the things the toddler licked last week] "No idea." It's 8:40am & I just broke up a fistfight over who gets the last tater tot, in case you're wondering how fulfilling parenthood is. Shout out to whichever childless person invented toys that erupt in an epic sound and light show when you toss em in the toy box at night.